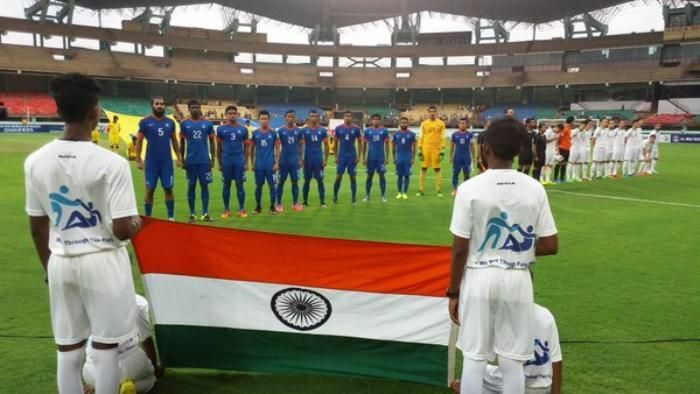 The Indian national football team succumbed to a 2-1 defeat to Turkmenistan in their final group stage game of the 2nd round of 2018 FIFA World Cup qualifying in Kochi on Tuesday, 29 March. The game started off in a cagey fashion, as both sides struggled to create chances in the opening exchanges. Both Narayan Das and Cavin Lobo saw their long-range efforts go over the bar within the first 15 minutes. However, in the 20th minute, India conceded a penalty as Pritam Kotal brought down Turkmenistan's Arslan Amanov inside the Indian box. The latter stepped up to take the resulting spot-kick, but put it wide off the goal, as the scores remained 0-0. Six minutes later, Sandesh Jhingan headed India ahead from a Narayan Das freekick. The remaining part of the first half saw India create a few more chances, but the Blue Tigers failed to extend their lead, as the teams headed into the break with the hosts leading. The second half, however, was a different story altogether. Turkmenistan drew parity through Arslan Amanov in the 49th minute when he headed in from a Didar Durdiyev cross. Twenty minutes later, defensive disarray in the Indian backline saw Serdaraly Atayew score the winner from close range for Turkmenistan. The hosts failed to create any more significant chances, as Turkmenistan managed to grab all three points from the game. With this loss, India have finished at the bottom of their group, with just three points from a total of eight games.